I posted this last year, a little late, and am reposting it this year for those of you who want to add a little of the Season into your gaming. I am a big fan of running seasonal adventures for my regular gaming group. Though my group hasn't played as regularly this year as they have in the past, I was inspired by Robert J. Schwalb's dark fantasy roleplaying game Shadow of the Demon Lord to write an adventure for this season. 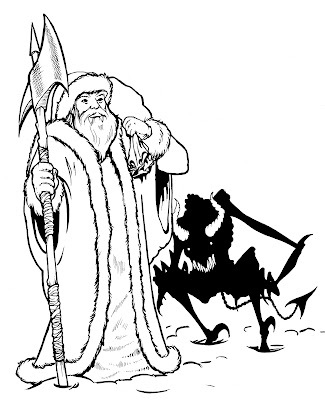 For the past few years, I've written and reshared adventures featuring Cthulhu Claus (based on my wife Jody Lindke's illustrations for an old Kickstarter) or the V'sori (evil aliens in the Necessary Evil setting for Savage Worlds), but this year I decided to feature Krampus -- that most devilish of Santa's helpers. While Krampus might be a bit played out for some, having gained mainstream notoriety, I'm still a big fan of the character and I have the pleasure of knowing an artist who has been participating in Krampuslaufen long before it was trendy to do so and Bill Rude's Krampus costume is amazing as is the fact that he can get even small children to pose with his horrifying costume. Bill Rude is a talented artist and you can look at a variety of his projects over at his 7 Hells: The Retro Art of Bill Rude website. 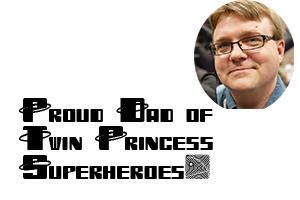 In this mini-adventure, the PCs are passing through the town of Nesbitt-Hill during one of their other adventures. You can use the map below to represent the portion of the foothills of the Iron Peaks immediately south of the Zauberspitz with Nesbitt-Hill being the northern-most community on the map and Tower number 3 representing the once great Beacon Fortress. 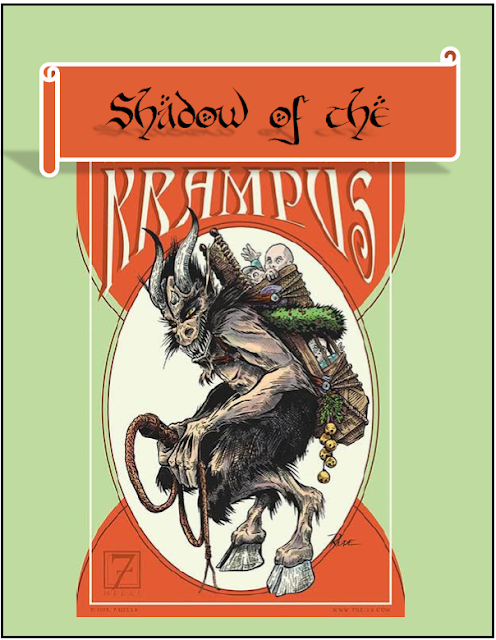 Shadow of the Krampus is a Novice (though not a "just now Novice") adventure for Shadow of the Demon Lord with a post-Christmas theme. The town of Nesbitt-Hill is a vital stop for wanderers and miners who brave the dangers of the Iron Peaks in search of adventure or riches. For years the town has been a peaceful refuge, seemingly immune from the spread of the Demon Lord's Shadow. For even as the Shadow has spread, the town of Nesbitt-Hill remains a spark of light an happiness in an otherwise dark and desperate world. But that changed last night. Historically, the Winter Solstice has been a time of celebration when the townsfolk of Nesbitt-Hill memorialize the the Solstice King and his champion Krampus. For it is this duo who has protected the town since the Battle of Zauberspitz where the Solstice King and Krampus defeated a horde of the Demon Lord's servants, or at least that is what the stories say. The stories also say that Krampus steals children who misbehave and returns them at the Spring Equinox after the darkness has been purged from the children's souls. If it is true that Krampus takes children and eventually brings them back, why is it that Krampus has taken no children for twenty years? Why does Mistress Oetzel swear she saw Krampus take adults this Winter Solstice? And why were these adults among the most generous citizens of Nesbitt-Hill? Has Krampus returned, but as a servant of the Demon Lord? Or is something else afoot? Download SHADOW OF THE KRAMPUS and find out. With the exception of the map depicting the area of the Iron Peaks I refer to as the Gronwald, an area that lies in the shadow of the Zauberspitz, all of the maps were drawn by Dyson Logos and were taken from his Commercial Maps webpage. According to the page, Dyson has released these images under the Creative Commons Attribution 4.0 International License. If I have used any images that are not covered by this license, I will be happy to remove them. The cover image of "Shadow of the Krampus?" was illustrated by Bill Rude, who was kind enough to give me permission to use it. Please visit his website and consider purchasing some of his art. The other image is the "survival map" from Robert J Schwalb's playing aids page for Shadow of the Demon Lord. I am using it with the intention of it being fair use, but if Mr. Schwalb deems my use inappropriate I will be happy to remove it. This adventure requires the use of the Shadow of the Demon Lord rule book since all monster statistics, with the exception of Krampus, are located within the pages of that "vile" tome. Krampus was designed using rules from the Of Monstrous Mien supplement. It is highly recommended that you also own Hunger in the Void and Terrible Beauty to add details around the edges of this adventure. The cartoon illustrations in the module are the work of my talented wife Jody Lindke. I included "rpg humor" cartoons because they remind me of the cartoons in the old AD&D Dungeon Masters Guide. I hope you enjoy the adventure.